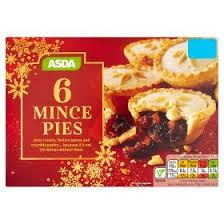 The Vegan Magpie: Asda mince pies! Hello! I'm seeing lots of people asking about mince pies, so in case you didn't know, Asda have officially marked their mince pies vegan! They in the packaging below. What's better is they are currently on offer at 2 for £1.50! Bonus! Just to point out, for some reason a few people have found boxes which only say vegetarian. I don't yet know why this is. So if you can, best to get the ones marked vegan!